The traditional Builders Trestle is a cost effective and practical solution to working at height and is favoured by both the Professional Builders and the DIY enthusiast. They afford the user a substantial platform of the 5 standard scaffold boards and are in such operations as brick/block laying, plastering, painting and general maintenance particularly in areas where it is not practical to erect access system platforms or tube and fitting scaffold. But times have changed and those who hire, buy and use trestles need to protect themselves, their customers and their employees from the risk of falling from them and then having to deal with the human, financial and social cost a fall from height can often bring with it. This is not to mention the legal implications of the new ‘working at height’ regulations. We now have a device that allows use of Builders Trestles and has the ability to give a cost effective solution to creating a system that can be fully hand-railed with the added benefit of stabilising the platform. 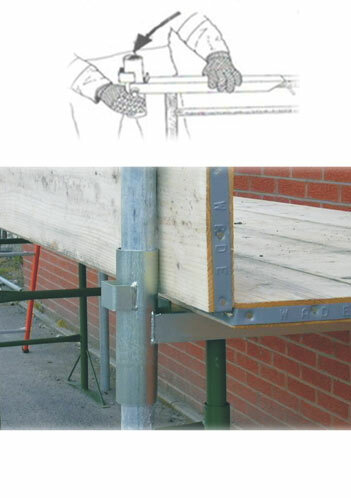 The ‘trestle-Form Easi-Clamp’ is compatible with either Aluminium Tube or conventional Scaffold Tube and fittings.